One of the strange aspects of boxing is that fighters often work their way to a title belt without having tasted defeat. Sometimes undefeated fighters go beyond just winning a title and are declared champions of their division by the people and even the pundits. Whether the undefeated status is the result of genuine brilliance or of a careful and calculated climb up the ranks an undefeated champion is must pass a final test. The legacy star fighters leave behind to the fans often depends on how they react after their first genuine destruction. Despite having already faced giants and claimed championships, in a sense tonight is the beginning of the real test for two fighters; Miguel Cotto and Kelly Pavlik. Beyond their own legacies the attention to the sport of many boxing fans is on the line. I'm referring of course to those fuzzy pseudo-ethnic undertones that pervade boxing. Both of these young lions have the hopes of their tribe and city riding on another successful run inside the ring. Can their warrior's spirit rebound from annihilation and keep the torch of boxing fandom alive in their communities? Puerto Rico's Miguel Cotto (32(26)-1) is the current darling of Boricua boxing fans. Predictably amongst the Dominican crowd there are as many haters as fans. I'm a fan. Last time out Cotto received a savage beating. After that we all had our doubts. 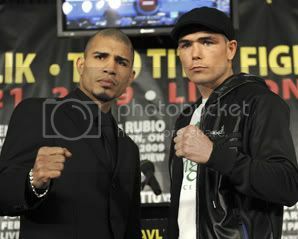 Cotto is unquestionably a world class fighter, but does he have what it will take to become an undisputed champ? Well time reveals the truth and we learned what actually happened that night against Mexio's Antonio 'padded gloves' Margarito. Now Cotto must restart the campaign up the ladder to get a crack at the champion, Shane Mosley; a man he has already defeated right here in NYC. Tonight Cotto is back at the Garden against a ranked contender, Michael Jennings (34(16)-1) of the UK. The opponent may not be a top 10 name but to Cotto's credit in his last fifteen fights only one opponent was arguably not top ten when they fought! He has earned a showcase fight. The show also features the comeback fight of popular middleweight champ Kelly Pavlik (34(30)-1). Pavlik is from working class Youngstown, OH and his skills and humble demeanor are earning him a following out in the heartland. He also was demolished recently when he moved up a weight class, however there is no shame in losing to one of our generation's P4P greats Bernard Hopkins. Tonight he is in against a tough customer, Mexican Marco Antonio Rubio (43(37)-4). Hopefully this guy is not another cheat like Margarito. Finally the card will also feature NYC-based Irish fighter John Duddy. I don't rate Duddy too highly, but I do approve of building up local stars slowly and steadily. He remains undefeated and with proper management, training, and experience he may prove me wrong and make it to the elite echelons. Unfortunately I couldn't splurge on tickets for this one but I'll likely order it on PPV. And if MMA is your game SpikeTV is broadcasting the UFC event from London,UK. I love these doubleheader weekends!